Posted on September 28, 2011, in Error Proofing, Problem Solving and tagged Error Proofing, Jamie Flinchbaugh, Jidoka, Manufacturing, Problem Solving. Bookmark the permalink. 8 Comments. Matt-great example of an important principle. Leaders expect their teams to do the right thing when it’s the hardest and most time consuming method too often. I agree with making it easy for staff (or customers) to do the right thing. I’m nit-picking a bit, but “poka yoke” is probably a better Japanese equivalent for error proofing. It’s part of the “jidoka” concept of building in quality at the source, stopping the line automatically when there’s a problem, etc. Thanks for the correction. After giving it some thought, I agree, ‘poke-yoke’ is probably the better term. Thanks. 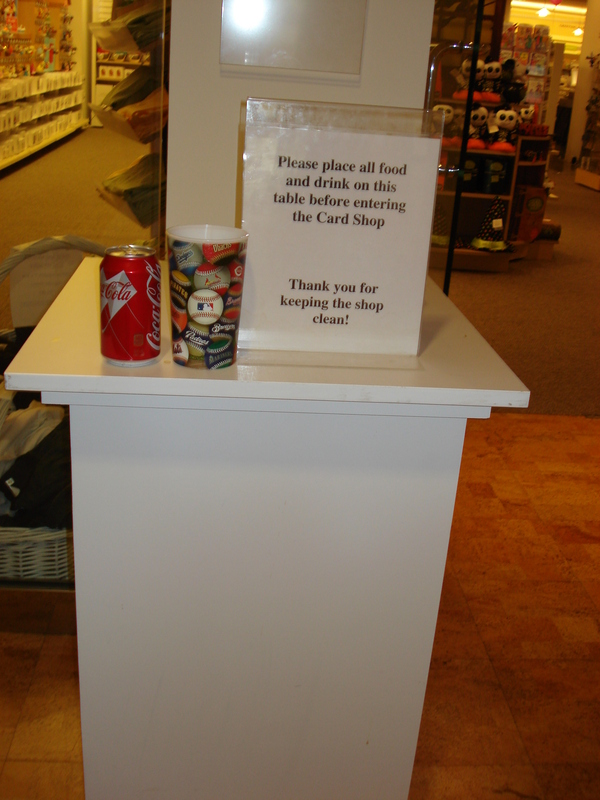 You could also ask, from a customer standpoint, why is the store telling me to not bring drinks in? If I want to shop with a beverage, isn’t that my right? I guess the store has the right to keep me out, but isn’t it more customer-friendly to just expect to have to clean up a spill once in a while? How many customers do they lose because of the “no drinks” policy? In this case, the store doesn’t lose any customers or very, very few. The flip could be asked about showing respect for the customers shopping in the store. What does a customer think if they see stains on the carpet in the store? Would they come back? What if someone bumps into them and spills that hot coffee on them that Jamie just spent $50 on? Not the stores fault but a person may relate that experience to the store. It is a fine line. Cleanliness and appearance does play into perception of a customer and whether they want to come back. Sometimes it is a heavy influencer and sometimes it isn’t. OK, that’s not really what it says, but that sometimes is what it feels like. What if I just got my $50 Starbucks drink – I’m not throwing it out. So my choice would be ignore the sign, or not go in the store (which is even worse). This won’t completely fix the problem, but it provides a solution to the behavior you desire. Simple. Mostly effective. And pretty much free. How do you stop the customer drinking in the store? Becomes how do you allow the customer to bring a drink into the store and not make a mess? Becomes how do you offer the customer a free cup of coffee whilst they are in the store browsing and buying? If I were a store manager, the drink spills on the floor wouldn’t bother me. Spills on the merchandise would. There is enough spoilage from handling and trying on as it is.